Ok, but what about the title? During the oppressive rule of the British in Burma, Eric Arthur Blair was a member of the British Imperial Police Force in Burma in the 1920s. Eric left Burma and decided to become a writer using the pseudonym George Orwell. His first novel was titled "Burmese Days." One of his later novel, the futuristic "1984," tells of a dystopian society watched carefully by Big Brother-- the omniscient, omnipresent head of the oppressive government. The phrase Big Brother is now used to refer to any oppressive and/or invasive surveillance. Recent documents made public by Scotland Yard identified George Orwell also got under the Big Brother surveillance due to his alleged leftist leanings. The writer Emma Larkin published "Finding George Orwell in Burma," where she noted that Orwell's Big Brother is still watching when she made the journey to Burma-- even in present day Myanmar! 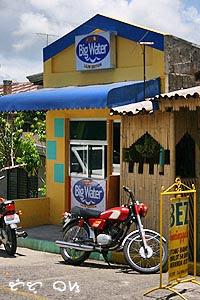 Pinoy Big Brother is the Philippine version of the popular Endemol TV show. The house on Governor's Island, Hundred Islands, Alaminos, Pangasinan where the housemates spent some time in one of PBB's seasons. 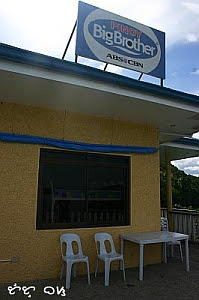 PBB house para nang tourist attraction right? I didn't know that about George Orwell, but I've watch his Time Machine on the movies! Pinoy Big Brother...I haven't seen the English version yet....is it any good? I've heard a lot about PBB but never actually seen the house. Interesting. Oh no, BB, the end of the sane world. i'm not a fan of that show either or any other local tv show these days for that matter. haven't read 1984 yet but i've read animal farm. really good book. hmm,im not aware of the TV program,hehe but the pics are good! thanx for the comment,tutubi,i see you around! I used to watch the show but for this season no...the airing is so late and besides I prefer to watch the regular PBB over the celebrity edition. ghee, if you're here in pinas, you'l always hear people talking about it. I don't know much about Big Brother show back there, besides I don't even watch Survivor or other shows like it. However, I've learned something here about George Orwell. That Big Water, cracks me up. I've never seen PBB (well, I don't live in Pinas) or the american version of BB. The show is essentially a rip-off of MTV's Real World, which isn't exactly going to win a Peabody anytime soon. I have watched my share of reality tv shows, but nowadays, I'd much rather watch youtube or play my guitar. ah PBB. with it, ABSCBN is trying to pull an orwellian big brother act over the filipinos. it's a thought crime to not watch it. therefore i'm a thought criminal then, a hardened one. btw, i think Time Machine is by HG Wells.